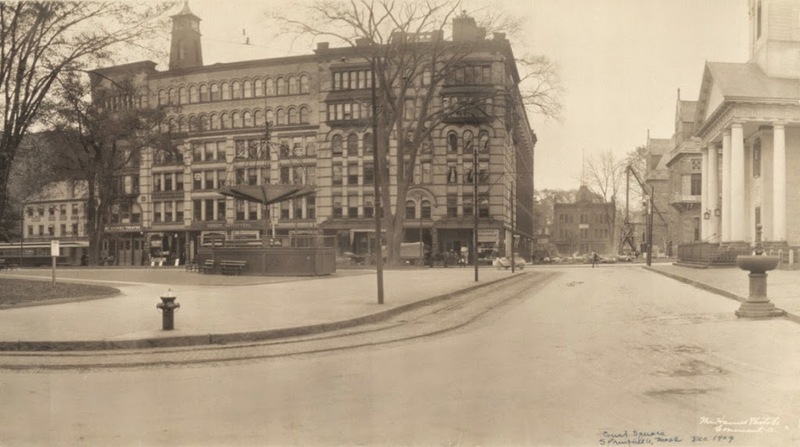 Here’s an interesting photo of Court Square, taken in 1909. Image courtesy of the Library of Congress, Panoramic Photographs Collection. Notice the difference? Because there isn’t a whole lot that has changed along the south and west sides of Court Square in the past century. In fact, other than cosmetic changes to some of the fountains and such in Court Square, the only real difference is the added wing of the old Hampden County Courthouse, which is visible in the 2012 photo just behind and to the left of the church. In the 1909 photo, if you look close, you can see the construction for the wing, but at this point when the photo had been taken, it had not yet been completed. 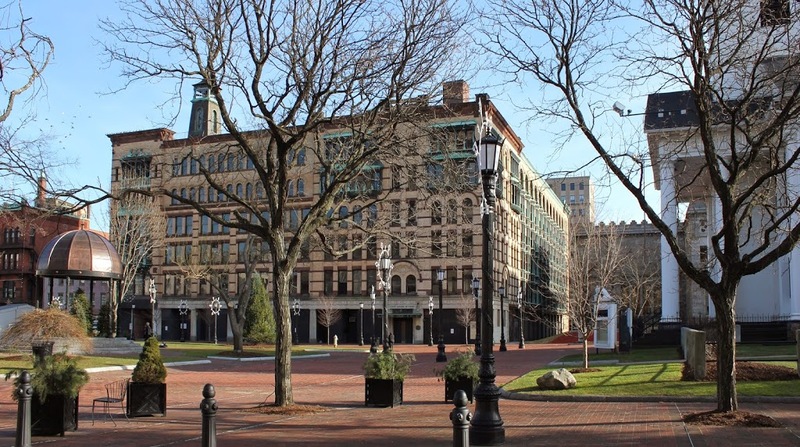 The prominent building in the center of both photos is the former Court Square Hotel. Built in 1892, it was added on to in 1900, with the sixth floor being added, along with the right-hand part of the building (the front facade used to be symmetrical until the addition). Just to the left of it is a small brick building, barely visible behind the gazebo in the 2012 photo. This building, known as Byers Block, was built in 1835 and is the only surviving one of a number of identical buildings that used to run along Elm Street in the mid 19th century. The oldest building in both photos, however, is Old First Church. Built in 1819, it was nearly 100 when the old photo was taken, and externally still looks essentially the same today. 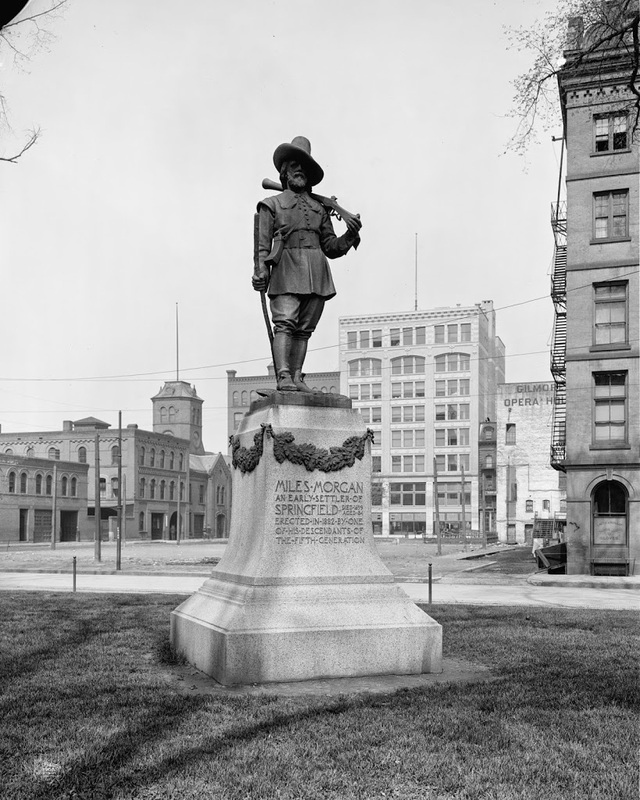 This photo, taken around 1908, shows the Miles Morgan statue on Court Square. 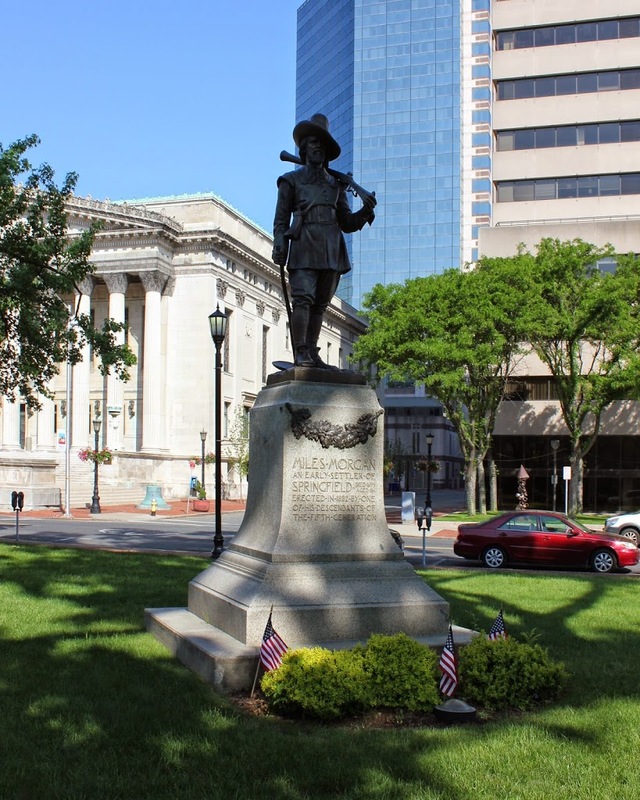 The statue itself was created in 1882, commemorating one of the early founders of Springfield, and is one of two notable statues dedicated to Springfield’s founders (the other, located next to the main library, is of my ancestor, Samuel Chapin). Image courtesy of the Library of Congress, Detroit Publishing Company Collection. This photo, taken in June 2013, shows what the same scene looks like today. 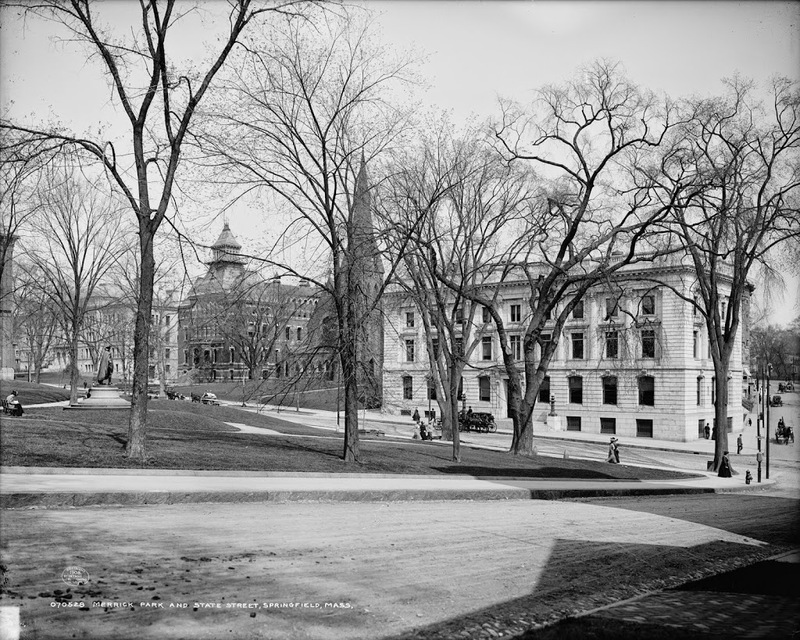 The statue remains, but everything else around it has changed; none of the buildings in the 1908 photo still exist today. Most of the ones in the background are on the current spot of the Sheraton, and the vacant lot in the foreground is, of course, no longer vacant. Just a few years earlier, Springfield City Hall sat on that site, and within a few more years, the new Springfield City Hall would be built, as part of the Municipal Group that includes City Hall, Symphony Hall, and the Campanile Tower. The old city hall, though, was not intentionally demolished – on January 6, 1905, it burned down, and the alleged culprit was, of all things, a monkey that overturned a kerosene lantern. Like Mrs. O’Leary’s cow, this may or may not have been the case, but either way the outcome was the same, and Springfield ended up needing a new city hall. See this post for a view taken around the same time, but facing the other direction. For another once-prominent Springfield landmark, notice the white, nearly windowless building on the far right in the distance. The side of it reads “Gilmore Opera House.” Built in 1865, it became the Capitol Theatre in 1920, and it was demolished in 1972. Taken between 1905 and 1915, this photo shows Christ Church Cathedral as it appeared a century ago. Image courtesy of the Library of Congress, Detroit Publishing Company Collection. 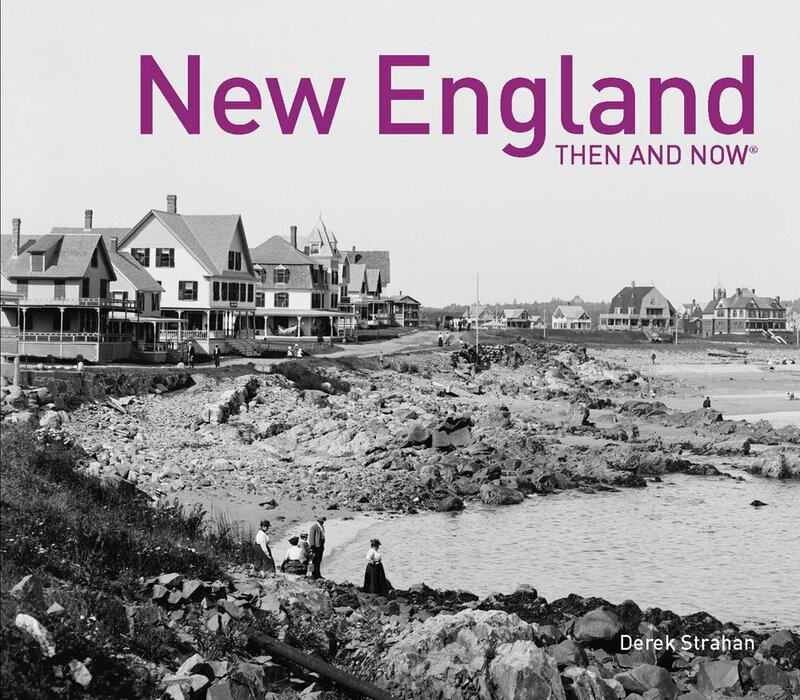 Not much has changed in these two views; even the art building of the Springfield Museums is still there, and the building barely visible to the far left also appears to be the same in both photos. The one major difference, of course, is the tower of the church. Originally built in 1876 with a tower (although I have yet to find an image of the original tower), the tower cracked within a year and was taken down for safety reasons. It would not be rebuilt until 1927. The view from Chestnut Street looking across State Street toward the corner of Maple Street, around 1908. Image courtesy of the Library of Congress, Detroit Publishing Company Collection. The first photo shows several important Springfield buildings. Starting in the distant left is the old Central High School, which later became Classical High School. To the right of it is the old Springfield High School, then the Church of the Unity, and finally, the Springfield Fire and Marine Insurance Company building. 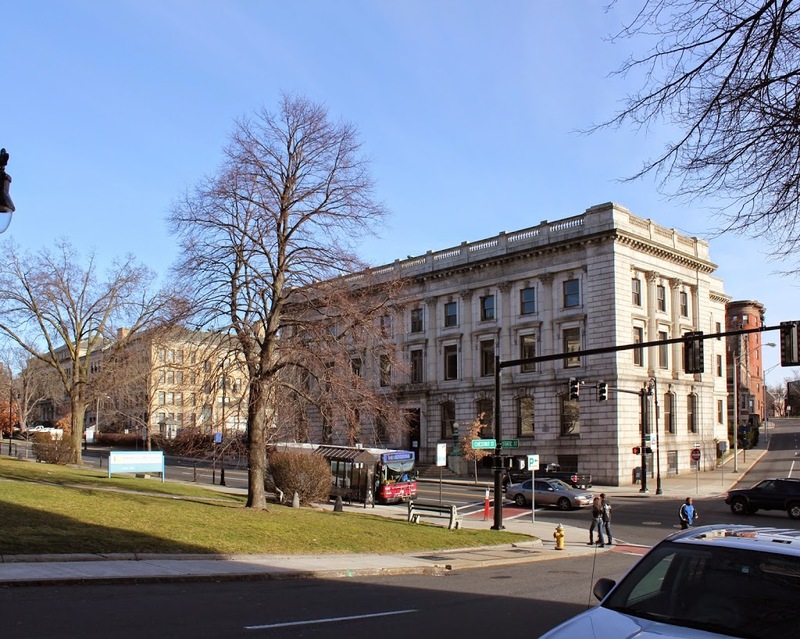 This building, completed just a few years earlier in 1905, was designed by the prominent architectural firm of Peabody & Stearns, and is an excellent example of classical revival architecture in Springfield. Today, Classical High School is still standing, with a new wing that was added in 1922 after the old high school building next to it was demolished. The school itself closed in 1986, and the building was converted into condominiums. The Church of the Unity was demolished in 1961 to make room for an apartment complex that was ultimately never built, and today it is a parking lot opposite the Springfield City Library. 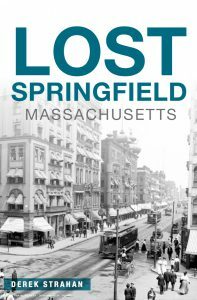 The only building that has remained unchanged from the first photo is the Springfield Fire and Marine Insurance Company building. For many years it was used as offices for the Springfield School Department, but it is currently vacant. Because of its historical and architectural significance, though, it is listed on the National Register of Historic Places. 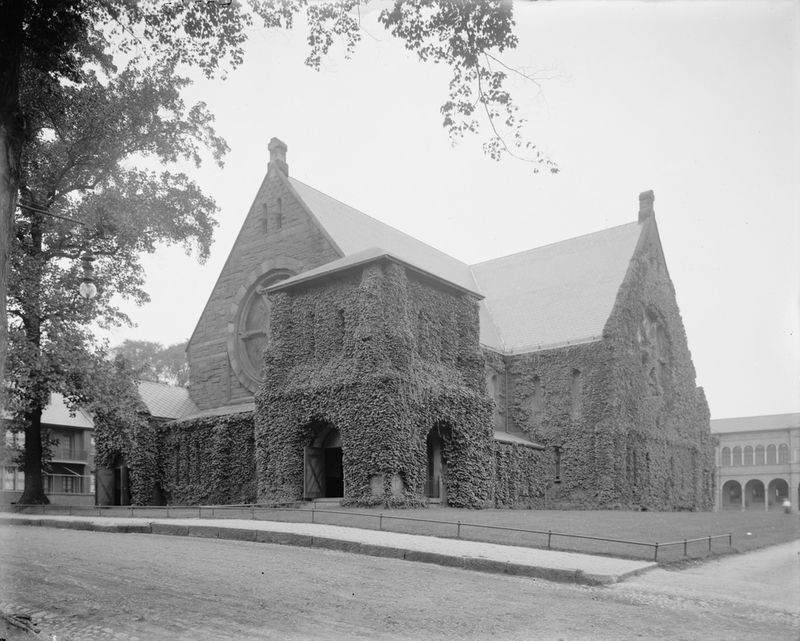 The view of Old First Church in Springfield, Massachusetts from Court Square, around 1908. Photo courtesy of the Library of Congress, Detroit Publishing Company Collection. 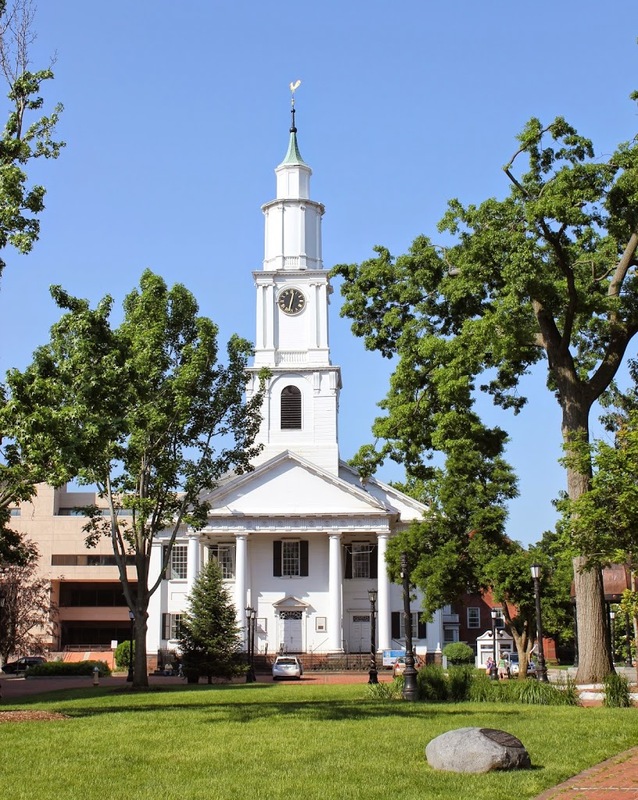 Old First Church has been one of Springfield’s most prominent landmarks for nearly 200 years. It is Springfield’s fourth meeting house, all of which have been located on or around present-day Court Square. The current building was completed in 1819, and was home to the First Church of Christ until 2007, when the congregation disbanded. 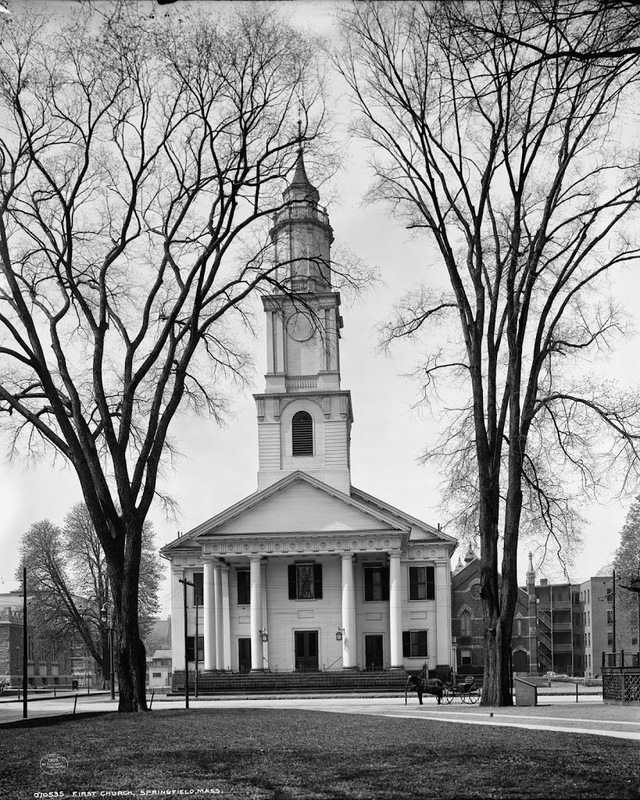 During that time, the church hosted notable guests including Daniel Webster, abolitionist John Brown, singer Jenny Lind, and evangelist D.L. Moody. In 1848, the body of former president John Quincy Adams lay in state in the center aisle, as he was being brought back to Quincy from Washington, D.C.
After the congregation disbanded in 2007, the City of Springfield purchased the historic building, and rent it out for various events. Note the missing railing near the top of the steeple – it was removed following damage from the June 1, 2011 tornado. Otherwise, the exterior of the building remains much the same as it was over 100 years ago. To the right, barely visible in the 2013 photo, is a brick structure that appears very different. 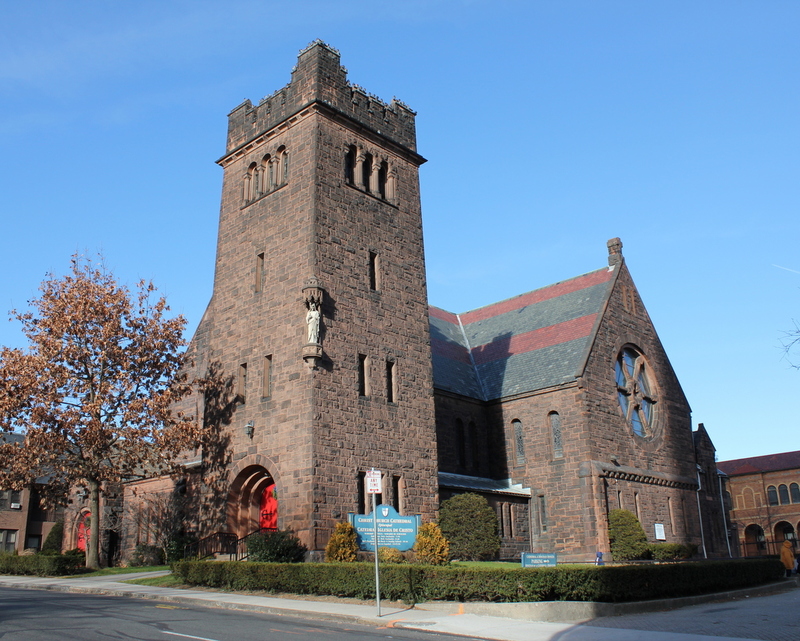 Physically attached to the church, it was gutted and renovated in 1947, which among other things included removing most of the Victorian-era windows and details.